Wildly creative designer Atsushi Nakashima needed a complimentary, but not too overwhelming, hair and beauty look to complete his spring 2015 collection. Working closely with the team from L'Oreal Professional for hair and the team from Maybelline New York (led by key artist Mizu) Nakashima landed on a chic, but not overly styled loose pony for hair, and a dewy make-up look that was accented by a metallic eye. Here's how the look was created, beginning with the hair. For male models, and females with shorter hair, a generous amount of L'Oreal Professional Tenue Extra Fixe Mousse was applied to give hair strength and support. 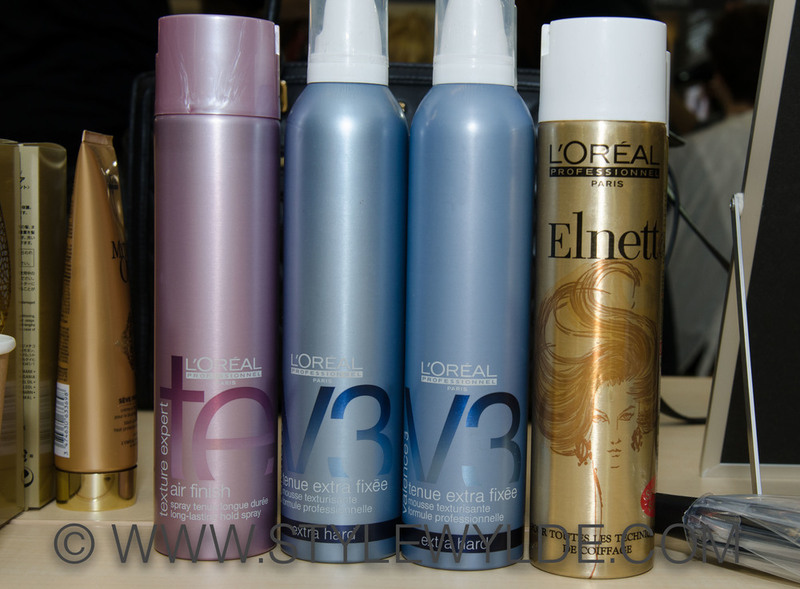 Hair was then worked into a tousled look and was finished with Texture Expert Air Finish Hair Spray to keep it in place. For models with longer hair, the process was a bit more complicated. Stylists began by smoothing ends of hair with a dry and flat brush. Hair was then wrapped around irons, to give it a large, wavy, but not curly texture. 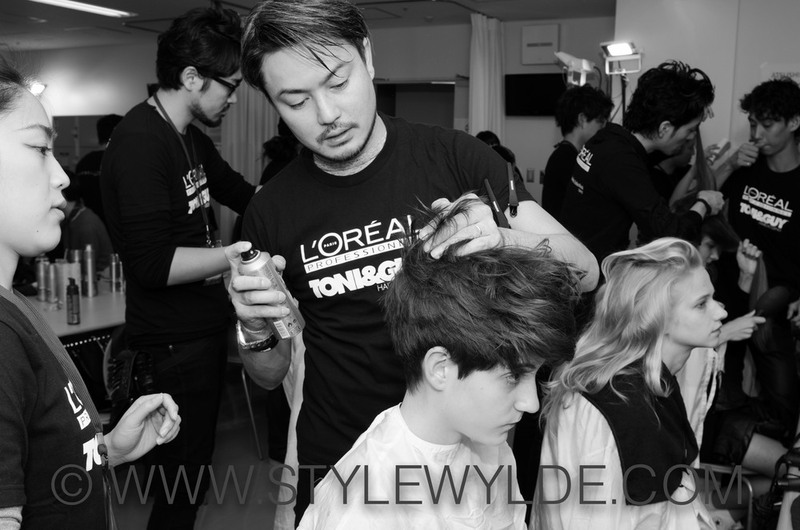 Stylists then worked generous amounts of L'Oreal Professional Tenue Extra Fixe Mousse, and L’Oreal Professional Mythic Oil through hair to create a slightly damp look. 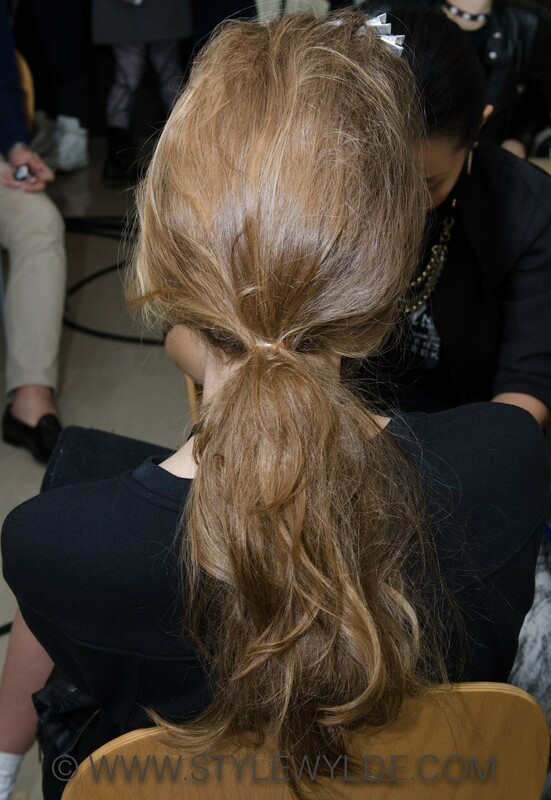 Hair was then pulled back into a loose, low pony and allowed to 'set' while models headed to makeup. Once hair had set, stylist reworked an additional dab of mouse through the hair and pulled out pieces in front to give the look a chic, relaxed feel. Meanwhile over on the Maybelline side of the room the team led by key artist Mizu began by using Maybelline BB Cream Moist 24 to give skin a fresh dewy look. Once skin was perfected the team used Maybelline quad shadows in smoky gray and silver to create the ever so light metallic eye the blended beautifully up into the brow. For more from the Atsushi Nakashima Spring 2015 runway show, check out the feature in Runway.